We’ve provided a few tips for finding your way to Salem and then finding your way around once you’re here. Please familiarize yourself with Salem’s Halloween policies and regulations to ensure a safe and pleasant visit. If you're looking for spooky or historic attractions in Salem, the map above will show you where some of the most popular ones are located. For more information, just click on the pumpkins! • DO NOT use a weapon as part of your costume - real OR FAKE. Police will confiscate anything that looks like a weapon. • Additional security measures are in effect. Backpacks, carry bags, etc. are subject to inspection by police. It's best to travel light. • NO public consumption of alcohol is allowed at any time. From October 29 to November 1, the fines for illegal behavior - including public drinking, vandalism, and littering - are tripled - up to $300. • Please be considerate of private property. Ample public restrooms are provided throughout the downtown area. • The public Halloween celebration officially ends on Halloween Night after the fireworks. Attractions, restaurants and taverns will continue to operate but central downtown streets will be cleared of pedestrians and access to that area may be restricted. 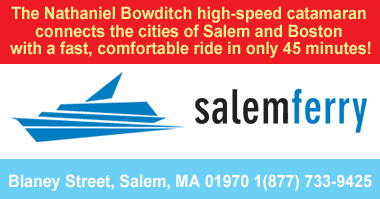 during your visit to Salem!